Having another opportunity to visit Sweden was a chance not to be missed. In the last few years I have been lucky enough to visit Sweden several times, and during each trip, I have not only been captivated by its awe-inspiring natural beauty, but also the remarkable Sounds of silenceâ€™, that are so prevalent within its landscape. Something I feel suits my overall style of photography. This time I had a very exciting visit planned. Which came with great thanks to the Swedish Lapland Visitors Board and also Voigt Travel. Who made this a possibility. Voigt Travel runs a very convenient charter flight service from my local airport of Rotterdam directly into SkellefteÃ¥. It takes around 2 hours and after a brief stop in Skelleftea it travels onwards to the Finnish resort of Rovaniemi. From SkellefteÃ¥, my journey led me along the main highway, which clings to the coastline of this part of northern Sweden. It was a nice journey. I frequently stopped at several locations of interest, mainly to capture the essence and feel of this naturally beautiful area. After visiting several places, and capturing suitable content, I decided to enjoy the last section of my drive, by exiting the highway and then travelling the tranquil back roads. These roads were quite spectacular as they continue to weave their way through thick forests and pass by very inviting lakes, that act like a mirror in their appearance. The evening mist begins to shroud one of the many traditional Swedish Barns, that are scattered all around. 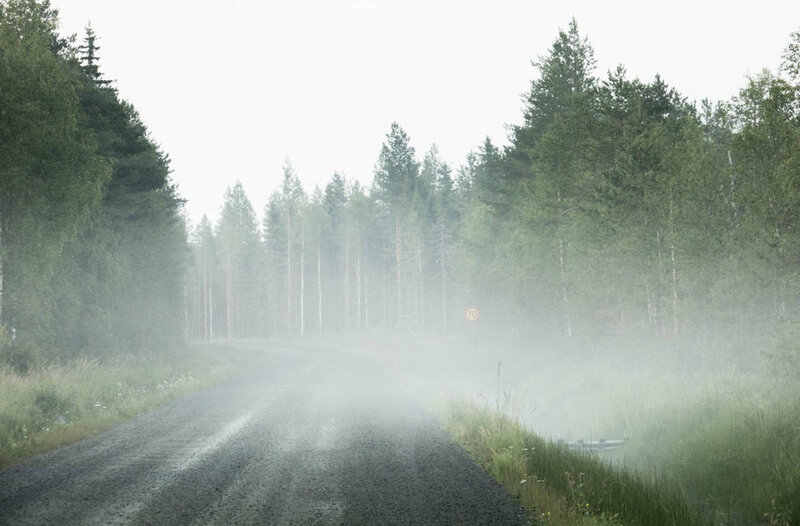 The Swedish back roads wind on into the wilderness. Inviting and mysterious, especially in the early evening light. Kukkolaforsen is my destination stop, and Iâ€™m amazed at how beautiful this place is. Located on the banks of the river Torne it is an important place for the local community and their livelihood. Especially as fishing from the river, is the main function and fish provides food for their families and local businesses. At my accommodation there is a fishing museum that helps explain a little more about the history and heritage of this particular area. It is an area steeped in history and interesting to read all about. It is enjoyable to see how the fish are caught from temporary wooden platforms and then either hung in a smoke house or presented beautifully on a plate, for others to enjoy. My stay is at the Kukkolaforsen Tourism & Conference. It is great accommodation and is located on the banks of the river. During my visit the owners Johanna and her husband Martin and her brother Mathias share their story, rich family heritage and all about their impressive local menu. All ingredients are naturally sourced, from the local surrounding area. Their food is amazing, and it is clear from the passion and personal touch that goes into the preparation and service, that the owners pride themselves on everything they do. A moment of silence. I stood here for a while as the sound of silence was so evident. After a brief overnight stay in Kukkolaforsen, my journey takes me north and eventually leads me to the Arctic Circle and beyond. I follow the picturesque highway 99 virtually all the way to Kiruna. It is a memorable journey, with long sweeping bends and relatively traffic free roads. Towards Kiruna the landscape begins to change dramatically. Here, you have travelled well into the Arctic Circle and the landscape becomes significantly more remote in its appearance with the trees that once covered, now become more sporadic in their coverage, as the land is given over to tundra. My visit to Kiruna is a special one. 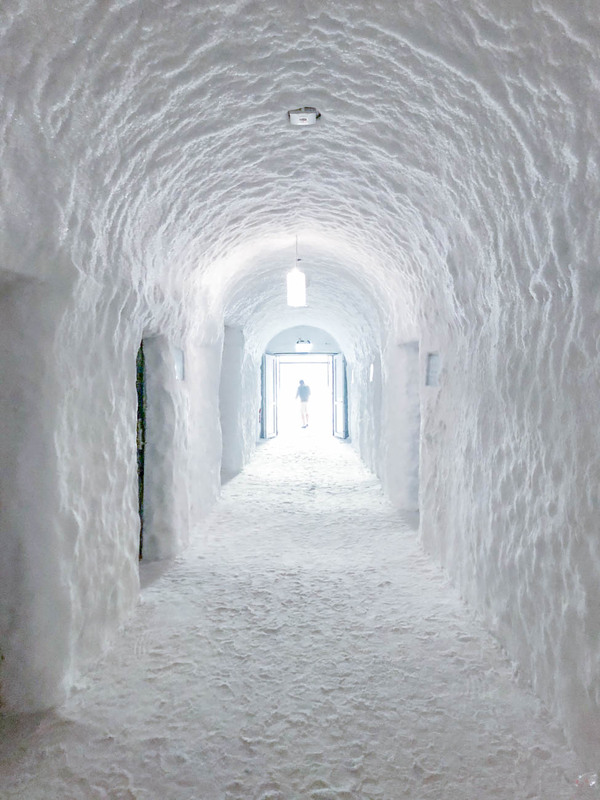 It is not only the gateway to the far north, but it is also home to the Icehotel. The place where I will be staying for my second night. The Icehotel was a unique to say the least. Cut from the nearby Torne river, the ice blocks form the main structure and architecture to this spectacular creation. 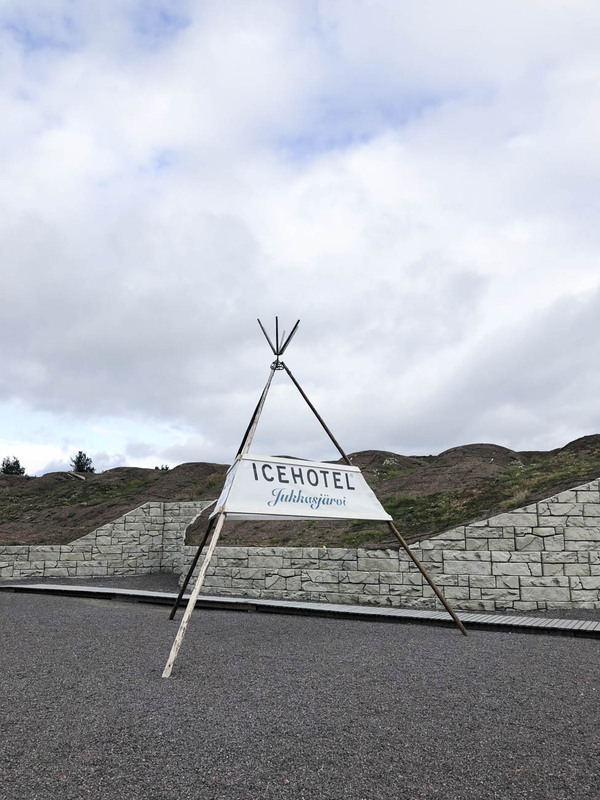 The winter and main hotel rises each year from the river, while the Icehotel 365 is available to stay in all year round. These natural materials are harvested (every year) from the river and then cut into blocks. Each block weighs around 1 tonne each. These blocks are crystal clear and form the main structure of the hotel. They are carved into impressive structures by a variety of inspiring artists from around the world. They all have the opportunity to create and influence with their own designs. Once the main outline structure is put in place, a fresh snow mix is then blown from the river and carefully packed all around the main ice columns. This helps the construction of Icehotel to become a stunning winter wonderland. 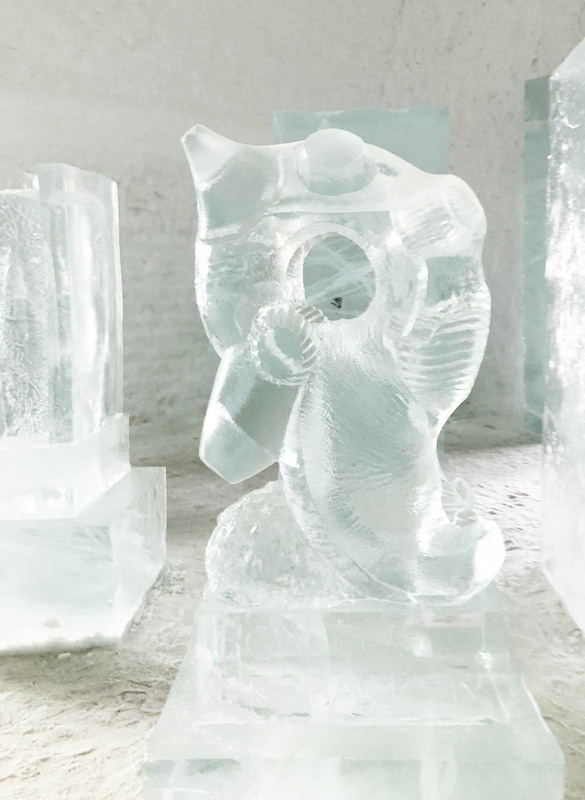 Unfortunately, the main winter Icehotel doesn't last forever and during the months of spring melt, the ice water begins to flow freely back into the river, only to be then recycled once again during the following year. Thankfully, the 365 (Summer) hotel provides an option for all visitors to stay in all year round. On the banks of the river Torne. The place where the purest water regularly turns to ice. This time, my stay was in the summer hotel and was a great experience. The room was themed with Mermaids and the Greek God Neptune. While the bed was carved in a traditional style with an ice base, and covered in Reindeer skins on top of the comfy mattress. Inside the room itself, the temperature remains at a constant minus 5 celcius and once inside the sleeping bag I was surprisingly snug and warm. Initially, I must admit, I did feel a little nervous at the prospect of staying the night in the freezing cold, but once I familarised myself with the unique surroundings, I loved every minute and would recommend it to anyone. From Kiruna I then travelled a quite stunning route up to the village of Abisko and the spectacular Abisko National Park. The drive up to Abisko is quite stunning and is actually regarded as one of Europe's best. With a stunning, unique landscape that surrounds all around. A remote, tranquil spot, so peaceful and moody. Where life is so simple. The jetty's of Lapland are a must for the local Fishermen. No matter what season. On arrival, I was in awe of this place. It was truly stunning and it was indeed a location I have wanted to visit for a long time. A stunning landscape that continues to battle against the weather, yet it is so rich and diverse in flora and fauna.Together with a wide range of animals living among the landscape, it makes for the great destination to visit. Especially for those travellers who simply love the outdoors. Abisko is a traditional small Swedish village found some 300km north of the Arctic Circle. Beyond the village and beyond its boundary, extending from the southwestern shore of the spectacular TornetrÃ¤sk Lake, lies the quite remarkable Abisko National Park. I stayed at the STF Abisko Mountain Station and here you can enjoy a really comfortable stay. It is located close to the main road and is right next to the train line and station, which connects to Stockholm with an overnight sleeper train. The accommodation has many great outdoor activities for all visitors to enjoy. So much so, right outside the grounds of the STF Abisko Mountain Station starts the Kingâ€™s Trail. This is a popular mountain hiking route that begins in the nearby national park and winds its way through some of the world's best natural landscapes to Hemavan, towards the south of Sweden. Not only is this area popular with all types of outdoor enthusiasts, it is also home to the Aurora Sky Station, which can be found on the summit of Mount Nuolja. This is an impressive observation centre, where the panoramic views are fantastic. To reach the summit, you can of course walk up or let the 2 seater chair lift take you there. This is a great experience in itself, as it slowly climbs up the mountain side and leaves you to revel in some great views. Once at the top you have the option to take a hike along a variety of different trails that weave northwards into Norway and also south, into some of finest looking valleys you could possibly find. At the station itself there is a small cafe and a rooftop viewing area for all enthusiasts and photographers to observe the spectacle that is the Northern Lights in Winter. The final destination stop was interesting and historical Niehku Mountain station, which is located right on the border with Norway. This was again perfect, but will form the basis of a new blog post, all about this impressive accommodation, so keep an eye of out for that over the next few weeks! I enjoyed every minute of this trip and once again, enjoyed being in such a beautiful area of Northern Sweden. It provided me with the chance to further challenge and develop my photography skills in one of the world's most dramatic and inspiring wilderness. It also allowed me to experience and meet some interesting locals, sharing in their history, customs and cultures, from a great corner of Northern Europe. I would like to extend a huge thank you to both the Swedish Lapland Visitors Board and Voigt Travel for choosing me to visit and for providing me with a range of wonderful experiences, I will definitely treasure forever.